I thought it would be fun to whip up some fresh pasta for dinner the other night, and I’ve made fresh pasta plenty of times. On one occasion, I even made beet pasta which was as delicious as it was pretty. Then, I realized I had never made fresh pasta into ribbons of any kind. Those rollers on my pasta machine that cut a sheet into long strands had never been used. The injustice. They’d been ignored for years. As I almost always do when making fresh pasta, I grabbed Marcella’s Essentials of Classic Italian Cooking . Making the pasta dough gets easier every time I do it. Mix eggs into flour, knead, divide, flatten, and then make whatever shape you want. For a sauce for this first-ever ribbon-cut pasta of mine, I chose Marcella’s roasted red and yellow pepper sauce with garlic and basil. It includes an interesting technique of peeling the raw peppers before cooking them rather than roasting them and then removing the charred skin. The reason for this was so that the peppers would still be firm when added to the saute pan. I should back up just a bit and explain what I learned about fresh pasta this time around. To make ribbons, you first have to roll the dough into sheets. Then, it’s important to let the sheets sit and dry for a few minutes before rolling them through the cutter. The sheets should be just starting to dry but not yet brittle. I could blame it on the humidity, but I probably just rushed it with my first couple of sheets. The fettuccine strands came out a little sticky and were difficult to place on a towel for further drying. Since the last sheet had sat a little longer, it went through the cutter much better and was easier to handle. The cut fettuccine was left to dry for a couple of hours before dinner. I started the sauce before boiling the pasta because everyone knows the sauce can wait but nothing and no one should wait for the pasta. Red and yellow bell peppers were peeled and then cut into large chunks. Olive oil was warmed in a large saute pan, and peeled garlic cloves were added. Marcella suggests only flavoring the oil with the garlic and removing it before adding the peppers. My love of garlic made discarding it impossible so I left it right there in the pan. The chopped peppers were added, and it all cooked together for 15 minutes or so. The peppers should become tender but not mushy. Salt and pepper were added. Meanwhile a large pot of salted water was brought to a boil, and during the last few minutes of cooking the peppers, the pasta was boiled. 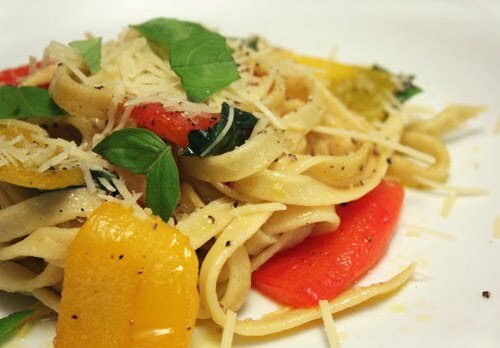 The fettuccine was drained and added directly to the saute pan along with torn basil leaves, butter, and shredded parmigiano. Even though I defied Marcella by leaving in the garlic, I thought its nuttiness was delicious with the sweet and slightly caramelized bell peppers. The freshly made fettuccine which I left in nice, long lengths was a delight with this chunky, fresh sauce. A penne or rigatoni shape would have been very good with this sauce too, and that just made me realize I haven’t made a homemade, tube-shaped pasta yet. This is exactly what I needed to see after 3 days of dreariness: fresh and undoubtedly as bright in flavor as it is in color! How easy (or not) was it to peel the peppers before roasting? I'd like to try it. The butter at the end sounds delicious (how much?) and as for leaving in the garlic, I concur! mmm...fresh pasta. next on my list. i have had the pasta roller sitting in the box in the garage for a year-talk about injustice! but you have inspired me. marcella's 'esssentials' was the first cookbook i chose for myself as an adult. will always hold a special place in my heart! thanks for the inspiration. TN: the peppers are surprisingly easy to peel. For the butter, a couple of tablespoons is good, but you could use more for added richness or less to keep it lighter. So flavorful! The kind of dish I love! Today I had also red and yellow peppers, but I prefer yours, light, yet flavourful. I tried doing it by hand one one time and that was a workout in itself. If only I had one of those pasta makers, I'd be making more pasta at home. It's definitely a nice combination with the bell pepper sauce. Yum!! You know...I've said it already. I will get round to making fresh pasta sooner, rather than later. Looks so fresh and juicy! that sound you hear is a round of applause coming from me. i commend anyone who makes fresh pasta, and that sauce sounds EXCELLENT. Yum - I just picked up a couple of bags of red pepper with the intention of roasting them and storing them in olive oil for later - I may have to divert some to try this delicious sounding recipe! Oh my, so yummy! I have never made fresh pasta! This is so lovely, beautiful. great job. 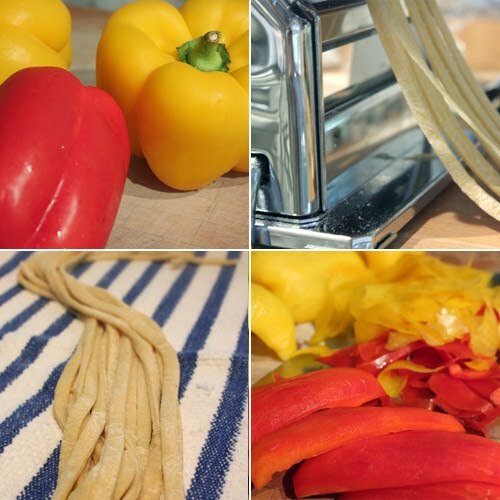 we adore making homemade pasta. My brand new pasta maker is still in the box...you just motivated me. I'm pretty sure I've never eaten fresh pasta before...your look absolutely perfect. I did try making it once, but never got the chance to eat it, which was prbably a good thing because it didn't really look very...good...lol. Lovely the vabrant colours and freshness of this pasta dish. Very very nicely done. Simple pasta - love the colors and looks delicious. Thanks for linking to your beet pasta...can not wait to try both recipes! 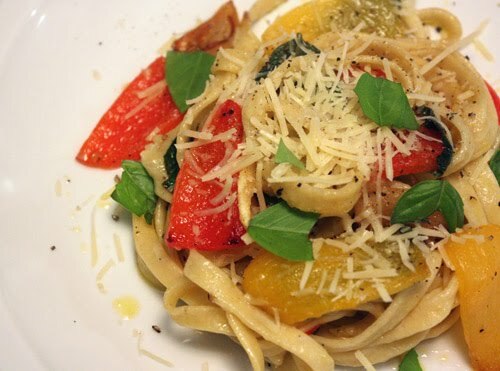 What a colorful and delicious pasta, yum! I'd leave the garlic in too, for certain. Looks great, hope to see your tubular soon! those peppers are beautiful! they're such a natural combo with pasta! mmm! Pasta is one of my fav when it comes to western food.